GEORGETOWN, Guyana – Guyana has denied allegations that it is facilitating international spy agencies crossing the border into Venezuela. Minister of State Joseph Harmon contended that the recent claim, by Venezuela’s former foreign minister José Vicente Rangel, is just another effort to bolster the South American country’s claims to Guyana’s territory in the face of international condemnation. Speaking on his television programme on Monday, Rangel said people were being trained in Guyana to destabilize Venezuela. He alleged that the United States’ Central Intelligence Agency (CIA), the British Military Intelligence (MI6) and the Israeli Intelligence Service (Mossad) have been collaborating in the military and intelligence training of Guyana Defence Force (GDF) troops. “I can categorically say that there is no such training taking place in Guyana, sponsored by the State or by any element of the State . . . it is not so,” Harmon said yesterday. 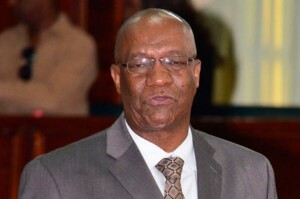 Harmon said when he was serving in the Guyana Defence Force decades ago, a similar claim was made, with the Times magazine alleging that Cubans were being massed along the border between the two nations. Harmon said he was instructed to facilitate a fact-finding trip from one of the magazine’s reporter who visited all of the GDF’s bases at border locations and was given free access to speak to any rank on the issue. The most recent allegation comes amid heightened tensions between the two neighbours, following Venezuela’s claim on territorial waters in the Essequibo region of the Atlantic Ocean that encompasses an area equivalent to around two-thirds of Guyanese territory, including an area where US oil giant ExxonMobil recently discovered oil. President David Granger has indicated he will address Parliament on the matter today.